Lab scale Reaction Injection Molding (RIM) is the most suitable manufacturing method if you need to make several copies of your design, for a project or for pre-commercial production. The OSTEMER resins easily fills small mold cavities thanks to the low viscosity and the low shrinkage stress enables very good feature replication. 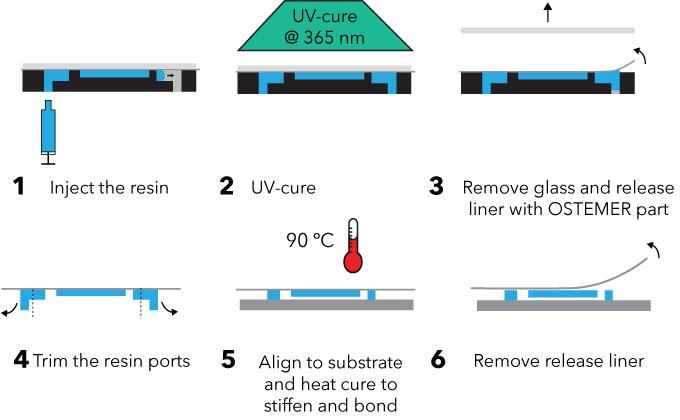 The rapid UV-cure to set the shape also enables rapid cycle times. 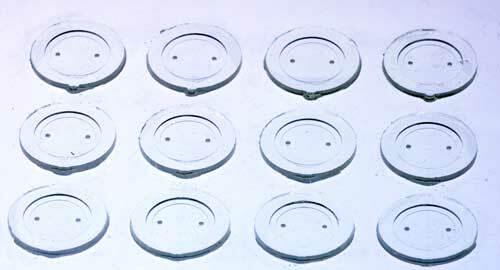 The molds used for injection molding are closed molds with one injection port and one or several ventilation ports. A straight forward and easy to implement mold design consists of a bottom part in precision milled aluminum and a flat glass plate with a release liner as a top part. Mix the OSTEMER components and debubble. Carefully draw up on a syringe. Close and clamp the two sides of the mold with the release liner under the glass plate. Slowly inject the resin into the mold. Apply underpressure to the ventilation port to facilitate filling of small features and also minimise bubble formation. 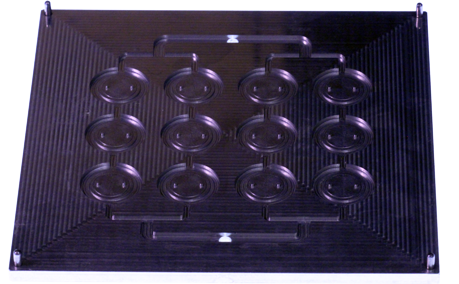 Slide the mold under the UV-lamp and expose. After exposure remove the top plate and carefully peel off the release liner and the OSTEMER article. When designing the aluminum mold it is important that the vertical sides of the aluminum mold are as smooth as possible and have no overhangs, sligthly slanted sides will make demolding easier. Once the OSTEMER article is removed you can trim the resin ports and separate into individual chips. Align the OSTEMER chips to a substrate and heat cure in an oven to stiffen and bond. FInally remove the release liner. Note: remove the OSTEMER from the aluminum mold after the UV-exposure as the second epoxy cure will react with aluminum and may damage the mold.